With an annual production of 6 million bottles, a cellar with wines dating back to 1946 and a proud family legacy, this is one of the behemoths of wine production in the Rhône Valley, and therefore, a great place to get a solid lay of the land. E. Guigal is currently run by father-son team Marcel and Philippe Guigal. Stéphane Croxet, who runs the export department of Guigal, graciously offered to give us a tour in either English or French. Since I am married to a Frenchie, my French has improved tremendously over the past few years, but I am not there yet with complete fluency, especially incorporating technical jargon and the velocity of speech. I was grateful for his lingual dexterity and the thoroughness of his explanation of the wine making process at Guigal. 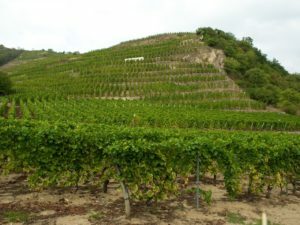 In the Northern Rhône, Guigal acts as both producer and negociant. However, in the Southern Rhône, Guigal acts exclusively as negociant. Negociants make the wine, but purchase the grapes from growers. Even though they don’t technically farm these grapes, negociants are heavily involved in the viticulture. As with a talented chef, most wine makers are super control freaks with their craft. I can relate to this. In fact, I embrace and salute the control freaks among us. Just try to be in the kitchen with me when I am cooking – things have to be done a certain way and in a certain order, with certain ingredients – I get it. Although, Guigal has the right to reject the grapes, it is a rare occurrence since Guigal has worked with these producers for many years, every step of the way in the viticulture process. In tandem, the respect for the relationship and time spent nurturing the vines is reciprocated by Guigal. Stéphane conveyed, “It’s only right that we respect the time and passion that they have put into harvesting the grapes for us. This courtesy needs to be extended to them as well.” Guigal has 2 back-up control methods in place for the machinery to ensure that grapes are received and processed ASAP to avoid wasting precious time. As in the case with some of the grapes for the production of their Châteauneuf-du-Pape, these growers travel for several hours from the Southern Rhône, so the back-up controls are critical to guarantee expeditious receipt of the grapes. For red wines, to extract as much color and tannins from the skins as possible, wines are either produced by remontage/pumping over or punching down. Remontage/pumping over draws wine from the bottom of the vat and then pumps it to the top. This helps to break up the crust of skins, pips. etc. (often referred to as the châpeau) which forms at the top. Punching down is the process of literally punching down the skins and pips with devices such as paddles or rakes to extract color and tannins. In the secondary/malolactic fermentation, the liquid from the châpeau is added. 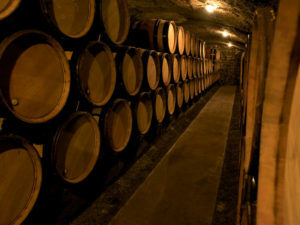 Guigal uses both large and small barrels for aging, with the large barrels used for red wines and small barrels for white wines. Red wine typically has enough tannins already, so the larger barrels are used as there is less surface area of contact by volume. Since 2003, Guigal has manufactured smaller barrels at a cooperage using hand selected French oak. Costly and precious new oak is saved for their absolute best wines. The Viognier for their Condrieu spends about 9 months on the oak, whereas the Syrah for their Côte-Rôtie can spend as long as 42 months. Typically, they use their barrels for up to 20-25 years and then send them to Scotland for the aging process of Scotch. Of the 6 million bottles produced annually by Guigal, half of their production is exported, of which, half of that goes to the United States. For Guigal, the U.S. market seems to prefer Châteauneuf-du-Pape. I am going to speculate on this, but one would have to think the heavy demand for Châteauneuf-du-Pape in the U.S. is driven by its favor among many influential wine critics. If you fell into the aforementioned population, I highly recommend branching out. Be zany. Mix it up. Try the Côte-Rôtie. Or throw in a real thought provoker – the Condrieu. You’ll be glad you tried something new. Prices indicated below are the cost at the vineyard and are not inclusive of import fees, taxes, shipping etc. I’ve noted wines in which Guigal both grows the grapes and produces the wine (Domaine). Unless noted, Guigal acts in the negociant capacity. 2005 La Turque DOMAINE (93% Syrah, 7% Viognier; 42 months in new oak, single parcel; 15 year old vines; ST 96/100 RP, $449): They were generous enough to let us taste one of the beloved and famous “La Las” – La Landonne, La Mouline and La Turque. Stéphane conveyed that they sell out right away on the release date (1 February). With a cult-like following, the futures market on this stuff is insane. Figs, dark cocoa, white pepper, tannins – still a little chewy – will age beautifully. What did we buy, why and what would I pair with it? 2007 Condrieu – I am infatuated with Condrieu – maybe even obsessed. Viognier can be a high maintenance grape, and this trickles down to the end cost. I loved the minerality, elegance and perfume of this one. I thought the price point couldn’t be beat. I’d have it as “apero” (tribute to my family in the south of France), with simply prepared and not too pungent seafood (ex. butter poached lobster, grilled whole fish such as a sea bass) or goat cheese. I am partial to cow’s milk cheese, so I think it would also be unbelievable with a goat cheese blend such as La Tur. The food should be simple and not complete with the perfume of this wine. I’d consume it within the next few years. For the Côte-Rôties below, I’d love to have either one of these with a grass fed, succulent steak cooked medium rare (because that’s how I like it), a great burger, something gamey like duck, a crystalized, aged cheese such as Gouda or a pungent cheese like Epoisses. 2004 Côte-Rôtie Chateau d’Ampuis – The priciest that we purchased from Guigal, we were able to benefit from the velvety integration which only comes with age. It continues to have fabulous aging potential and a complexity to match. We’re storing some of these, but drinking some too. I think it will continue to evolve for the next 10 years. 2005 Côte-Rôtie “Brune & Blonde de Guigal” – A great year, a great wine and a great bang for the buck. This has some fantastic aging potential and depth. I loved the finish. I’d drink now, but it could also continue to age for the next 10 years. Part 1: The region demystified. Some find wines intimidating. There’s absolutely no need for this. Wine is supposed to be fun and enjoyed. I think it’s critical to know what’s behind the curtain in order to establish a base understanding. For some, this section might be too much information (and might have the same effect as listening to Charlie Brown’s teacher prattle on). All good- just skip down to the tasting notes or flash forward to the tasting party. The Vintages – Great Expectations? 2007: “Sunny vintage, rich and fat wines, with an interesting roundness, medium keeping potential,” said Stéphane Croxet, Head of the Export Department at E. Guigal. “2007 was cloudy but not rainy. We had a wonderful month of September with a 3 week period of sunny and hot weather.” commented Lionel Faury, who works side-by-side with his father Philippe at Domaine Faury. Terroir – What is it and why do we care? terroir = location + climate + varietal(s). It is the primary impetus for the performance of the wine. Therefore, it makes sense that the French would name their wines after the terroir. In Côte Blonde, the southern vineyards, Viognier dominates. The sandy, schist and calcareous soil on top of its granite base produces elegant and feminine wines with a great deal of finesse. 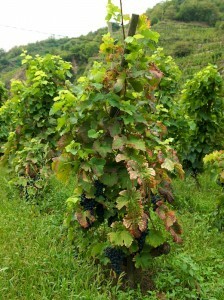 In Côte Brune, the northern vineyards, Syrah dominates. The schist and iron rich soils along with the different micro-climates produce powerful and more tannic wines. The terrain is precipitously steep, so hand harvesting is mandatory (and required for AOC regulations). Vines produce their finest offspring when they think they are dying; therefore, the best grapes for wine grow in poor soil (rather than fertile soil). In order to achieve the finest grapes, proper pruning is essential. They use Single Guygot and Gobelet pruning in the Northern Rhône. Vines are then generally trained into a tepee shape to provide stability from the strong winds. Condrieu is 100% Viognier. No doubt, she is the fair maiden of the land. As such, many producers proudly stake signs along the mountainside claiming their territories. Viognier is a difficult grape to work with because it can rapidly build up high sugar levels. These wines continue to evolve immensely as soon as the bottle is opened, metamorphosizing into many life forms. I believe the only way to truly experience the potential for this wine is to consume it over the course of an hour or so. It is elegantly perfumed with scents of violets, honeysuckle, peaches and apricots. At first, the wine screams, “I am a dainty lady;” however, you quickly realize how cerebral this dainty lady can be. She is no shrinking violet and is a force to reckon with. Côte-Rôtie (literally translates to roasted slope) is predominately Syrah based. Producers are allowed to add up to 20% Viognier. Some are starting to stick closer to 100% Syrah for their Côte-Rôtie and most of the producers I met keep the Viognier allocation below 10%. The producers we visited actually grow the Viognier for their Côte-Rôtie directly alongside the Syrah, which I found interesting. Stéphane Croxet elaborated, “That is to say that the Viognier vines are scattered within that Syrah ones and the wine-makers work as if they had only one kind of grape planted. Both varieties are harvested at the same time and co-fermented. That is something traditional here in Côte-Rôtie, used to soften and give a more feminine touch to the Syrah.” It is a beautiful, elegant and sophisticated red which, in my opinion, people don’t take enough notice of – OR – if they do, they drink too young. Typically, a Côte-Rôtie will have notes of violets and spice. These wines can stand toe-to-toe in a food pairing with foods similar to what you’d pair with a premier cru from Bordeaux. Saint-Joseph: Syrah based with up to 10% Marsanne and Roussanne. The southeast facing slope soil is sandy, granite, shale and gneiss, with some clay. Typically, it has scents of black fruit. Hermitage Rouge: Syrah based with up to 15% Marsanne and Roussanne. The soil is primarily granite. It tends to be silky, spicy and plummy, with scents of black fruits. Crozes-Hermitage: Syrah based with up to 15% Marsanne and Roussanne. The soil has some bits of clay, is pebbled and well filtered. It covers 11 communes. In most cases smoky, raspberry aromas linger. Cornas: This is a sought after, sun trapped, small parcel of land. It is 100% Syrah, dark and inky in color, with scents of black currants and black fruit.